White gemstones and white gold are brought together with style and grace in this Christian Dove Ring from Apples of Gold. 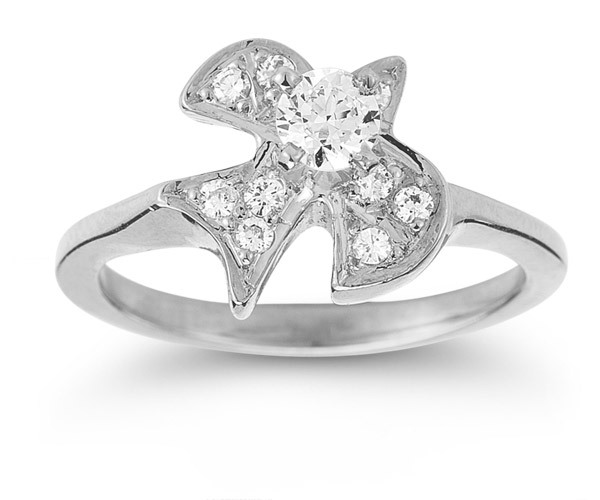 A single dove, crafted of 14k white gold, sets the tone for this piece, while a 4mm white cubic zirconia stone graces the center of attention. Surrounded by smaller accent stones, this dove figure truly shines. The band of gleaming 14K white gold continues the contemporary look with a high polish finish. Apples of Gold Jewelry guarantees the Christian Dove CZ Ring in 14K White Gold to be of high quality and an authentic engagement ring with real diamonds, as described above.